Hello! My name is Louella Kardashian. My hubby, Longfellow, and I moved to Flagstaff from Phoenix to get back to nature. We wanted to get away from the concrete, asphalt, crime, and smog. He’s been talking about returning to the “forest primeval” for years. 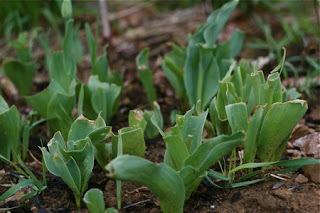 I had my gardener plant tulip bulbs, 400 of them right from Holland, along the drive leading up to our house. I’d waited all winter long for that lovely row of tulips to burst forth with new life in the spring. Well, wouldn’t you know, I went out with my coffee mug in hand, and they had all been mowed down, right down to the ground. Who would be mean enough do such a thing? My heart sank. Tell me, what am I to do? I’m losing my optimism and zest for life. I’m sorry about your heart. Nature struck back. The elk and the deer mowed them down. Just think, you were feeding the elk and the deer, your friends and brothers. I’m surprised they didn’t send you a thank you note. Besides, just what made you think that nature wanted to be close to you, just a strand of rusty barbed wire away? Nature just might like some privacy, too, like being left alone. Here’s some ancient advice! In about 400 A.D. Saint Ambrose wrote from Milan to Saint Augustine after Saint Augustine had moved to Rome: “When I go to Rome, I fast of Saturday, but here I do not. Follow the custom of whatever church you attend.” When in Rome, do as the Romans. When in the forest, do as the forest. If you don’t see tulips in the forest, it’s smart not to plant tulips. If you want to bolster your optimism and charge up your zest for life, don’t fight the laws of nature, like Sisyphus pushing a rock uphill or Icarus flying too close to the sun. 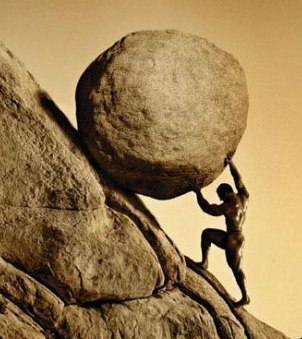 Sisyphus’ rock kept rolling back down, and the sun melted the wax on Icarus’ wings. Don’t plant flowers and vegetables just because you like them. Plant what the forest likes. Don’t be a city slicker. Fit in! It’s not a heavy idea. I’m not at all happy with your reply. I’m sensitive, and you hurt my feelings because you really didn’t deal with my pain. You seemed to dismiss it. Besides, I miss my camellias, gardenias, and azaleas. Longfellow’s just as happy as a pig in a sty. He sits out there next to that nasty old rusty barbed wire fence breathing in fresh air. He smoked clouds making bunches of money. He still coughs a lot. Says it’s good for his health breathing in fresh air. I don’t care what you say. I’m going to plant the tulips again. Those deer and elk aren’t going to get the best of me, not Louella Kardashian. I’m going to show them. I hate to rain on your parade, but the deer and the elk are going to win. I’ve heard from the shrinks that one of the best tests for insanity is repeating an action that failed the first time all the while expecting success by repeating the failure. Forcing your will on nature isn’t the way to garden. Nein über Alles nonsense. There's no place for hubris in gardening. Welcome to the high country. Cooperating with God is a smart policy. God is speaking to you through the elk and deer. Dana Prom Smith edits GARDENING ETCETERA for the Arizona Daily Sun and emails at stpauls@npgcable.com. 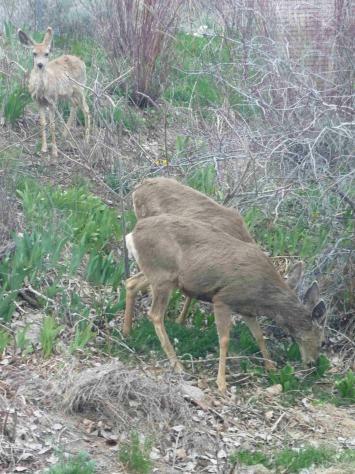 I work at the Olivia White Hospice Garden and we have many deer but they don't seem to bother the tulips. There are too many opportunities for food like the roses, delphiniums, and phlox. Each fall though we are required to replant the tulips, because the rock squirrels dig them all up and eat them. At least we get to enjoy the flowers.